The domestic Yak has been developed from the wild Yak, several hundred of which still exist in remote areas of the Tibetan Plateau and adjacent highlands of China. Here the wild Yaks live on scanty herbage found at heights of 4000-5000 metres and the mean annual temperature is around zero. Mature bulls are up to 1.6 metres high at the shoulder but the females are much smaller. 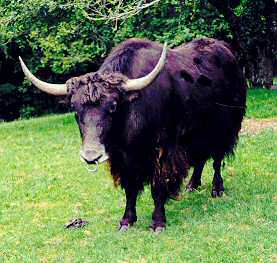 Wild Yaks are dark brown in colour with a grey dorsal stripe and muzzle. Some authorities claim that the Yak was probably domesticated in Tibet 7000-8000 years ago, but others consider it was less than half of this. The domestic Yak is much smaller than its wild counterpart, due to both selection and cross-breeding, and is more variable in colour – ranging from white, through brown, red and piebald to black. The average height of domestic bulls in greater China is 1.25 metres with a body weight of 360 kilograms; females average 1.1 metres and have a body weight of just under 230 kilograms. Higher figures are claimed for those in North America. The Yak is very well adapted to harsh conditions, having long outer hair and a woolly undercoat. It is used as both a pack and riding animal at high altitudes, and can carry up to 150 kilograms for long distances. It is also kept for its milk, butter, meat, fibre (both the long hair and the woolly undercoat being used), hides, horns and dung (as fuel). Domestic Yaks were imported into Europe in the 1850s and into North America about 50 years later. Some Yaks were imported into New Zealand from the Toronto Zoo in the late 1980s and released from quarantine in 1990, but they are kept here more as a novelty item than for commercial production. It has been estimated that there may be over thirteen million Yaks in the China-Tibet-Mongolia region, but they are generally rare in other parts of the world. 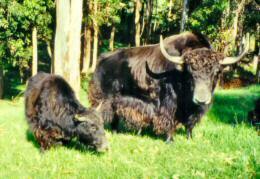 Domesticated Yaks are often cross-bred with other cattle, producing strong, vigorous offspring, of which only the females are fertile. Some such cross-breeding has taken place in New Zealand.